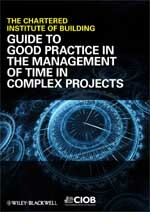 Lynda Bourne has a post about a new book to be published in the United States this month: "Guide to Good Practice in the Management of Time in Complex Projects" . It was written by the Chartered Institute of Building in the UK. I was intrigued by the title, and although I have not read the book, there is a nice 8 page Preamble at the publisher's site that invites more reading. From that free document come the principles shown below. Of the four principles listed, three deal with risk--I guess that follows naturally from the topic of the book which is complex projects, complex enough to require some serious analaysis to synthesize a schedule from the project plan. I like the one second one because it speaks directly to the role of architecture in the design of the project narrative and the management of risk. I don't necessarily agree that parallel structures are needed, but definitely there needs to be loose coupling between problematic elements, even in sequence. ■ A practically achievable strategy for dealing with intervening events during the design, procurement and construction processes.